The touch screen has properties of dirty. To get rid of dust, fingerprints, dirt, stains can be quite simply at home. Turn off the phone. 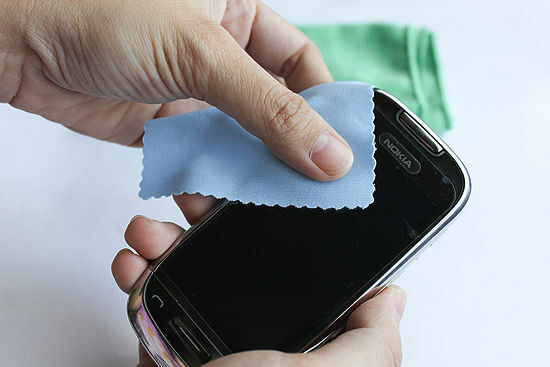 Wipe the screen with a dry microfiber cloth without pressing. Moisten a corner of the cloth in distilled water and squeeze well. Wipe with a damp part of the screen in a circular motion. Flip the cloth and dry clean side once again wipe the screen. Do not try to wipe the screen dry, the water itself to evaporate, 1-2 minutes. Dampen a microfiber cloth with warm, soapy water and rinse under running water. Leave the cloth to dry on a horizontal surface. Do not use water from the tap, as you will spot.